In a first-of-its-kind demonstration, researchers at the Department of Energy's Pacific Northwest National Laboratory have vitrified low-activity waste from underground storage tanks at Hanford, immobilizing the radioactive and chemical materials within a durable glass waste form. Approximately three gallons of low-activity Hanford tank waste were vitrified at PNNL's Radiochemical Processing Laboratory in April. 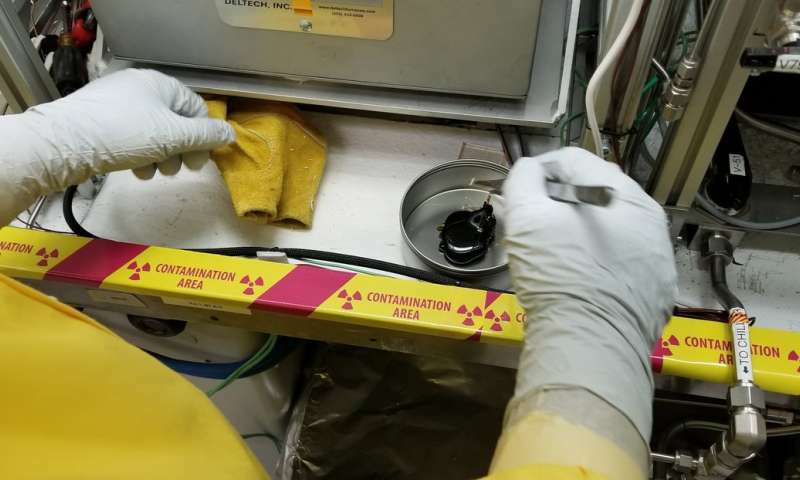 The laboratory-scale demonstration is an important step toward the eventual treatment of millions of gallons of hazardous waste generated during past plutonium production at Hanford. "This was the first time low-activity Hanford tank waste has been vitrified in a continuous process, very similar to the treatment process that will be used at Hanford, rather than as a single batch," said Albert Kruger, glass scientist with DOE's Office of River Protection. "The experience from this test will help us as we prepare for full-scale operations." Researchers at PNNL performed the work in partnership with Hanford tank operations contractor Washington River Protection Solutions and ORP. To vitrify the material, researchers mixed the liquid waste with glass-forming materials and pumped it, at a controlled rate, into the melter. Approximately 5 inches in diameter, the melter sits inside a furnace that keeps the glass forming materials within it at 2100?F. A half-pound of glass poured from the melter every half hour, and the test produced approximately 20 pounds of glass. "This successful test confirms the science and engineering approach," said Will Eaton who led the test for PNNL. "Seeing actual Hanford low-activity waste being converted to glass is really exciting. It ties together 20 years of work from the design and construction of the Waste Treatment Plant to the research and testing that has supported that effort." The vitrification test was the most recent in a series that used the PNNL-designed test platform to mimic the key processes to be used in the Direct Feed Low-Activity Waste system being constructed at Hanford. DFLAW will remove solids and cesium from tank waste and send the resulting low-activity waste to the Waste Treatment Plant for vitrification inside large melters. In tests leading up to the vitrification, the original high-level tank waste was pretreated inside a PNNL hot cell. 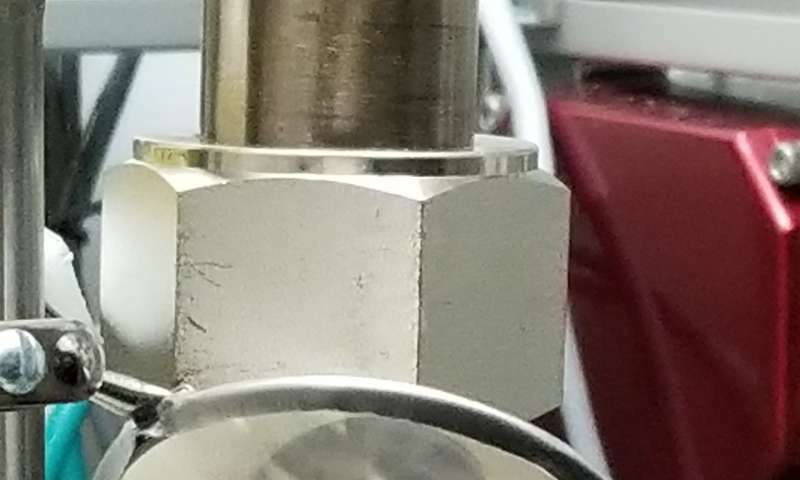 There, researchers used a filter and ion exchange columns to remove solids and cesium, leaving a low-activity solution containing dissolved waste constituents. Off-gases generated during the vitrification process produced a liquid condensate which will be concentrated and grouted later this spring in another related test. The grouted material will be analyzed to see if it meets disposal requirements. A second laboratory-scale vitrification test is planned later this year using approximately two gallons of waste from a different Hanford tank. Pretreatment of that waste will test different filtration and ion exchange methods. "Being able to run real tank waste instead of simulant through these tests provides valuable input for validating and refining our approach to the treatment of low-activity waste," said Kris Colosi, the WRPS project manager. "It's another important step toward the removal and disposal of a large portion of Hanford's tank waste." PNNL, which is located near the Hanford site, developed the liquid-fed ceramic waste melter technology in the 1970s and it has become the standard for waste vitrification in this country and elsewhere around the world. Numerous melter tests have been conducted in the decades that followed, including both small- and large-scale simulant tests and pilot-scale tests with high-level radioactive waste.